We are open Easter long weekend, every day 9am-5pm. Russell Nursery is located in beautiful North Saanich and is situated on 3 ½ acres of landscaped grounds, surrounded by mature firs. The tranquil, rural atmosphere makes it pleasant to browse through the nursery rain or shine. Our primary focus is plants but we also offer a wide selection of garden art, garden giftware, fertilizers, soils, and pest management products. We are also the only B.C. distributor for Halls English Greenhouses. At Russell Nursery we are proud of our knowledgeable and well-trained staff and we are committed to making sure our customers leave with practical advice and plants well-suited to their needs. Come check out all our fantastic new pottery! 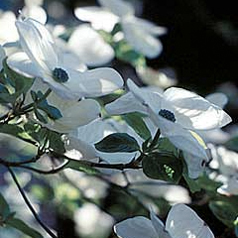 It’s dogwood season! Come pick one out before they’re all gone. Thinking of Mother’s Day already? Tickets are now on sale at Russell nursery for the Musical Garden Tour. Lightweight but incredibly sturdy, high-quality ladders from Japan. Did you miss out on our bare-root roses? Potted roses will be available in June. Otherwise, pre-order for 2020! See our online catalogue here. Award-winning, high quality greenhouses at an affordable price. See our dedicated website for further details. Subscribe to our newsletter for nursery news, seasonal gardening information and class schedules.